Cardio (legs) and biceps training don't mix. You may remember my 2015 article about how "HIIT-ing it After Arm Workouts Will Ruin Your Gains" ((re-)read it), well the authors are back and published a follow-up study in the latest issue of the Journal of Sports Science and Medicine. In it, Shigeto Tomiya and colleagues from Japan write: "Changes in CSA might be affected by subsequent cycling exercise after 8 weeks of training." And indeed, the relative difference between the 12.1% and 5% increases in biceps muscle size the scientists measured is the reason for concern for everyone trying to increase his sleeve sizes as fast as possible. With their previous study investigating the effects of relatively hard interval training, the purpose of the present study was to examine the effect of 30-min moderate intensity cycling exercise immediately after upper-body resistance training on the muscle hypertrophy and strength gain. "30-min moderate intensity endurance training at 55% load (W) of VO2max using a cycle ergometer immediately after 30 min of the resistance training protocol (CT) or on separate days at least 24 hours apart (SEP)" (Tomiya 2017). The subjects, 14 male volunteers (age: 22.0 ± 0.7 years, height: 1.72 ± 0.05 m, weight: 62.1 ± 5.8 kg, arm-curl 1RM: 22.3 ± 3.0 kg), were randomly divided into two groups. One group performed the previously described moderate intensity (55% of maximum oxygen consumption [VO2max], 30 min) cycle training immediately after arm resistance training as concurrent training (CT; n = 7, age: 21.8 ± 0.7 years, height: 1.68 ± 0.06 m, weight: 60.3 ± 7.4 kg); the second group performed the same endurance and arm RT on separate days as control group (SEP; n=7, age: 22.1 ± 0.7 years, height: 1.76 ± 0.05 m, weight: 63.8 ± 3.6 kg). Figure 1: Concurrent training protocols. RT, resistance training; ET, endurance training; SEP, concurrent endurance, and resistance training on separate days; CT, endurance training immediately after resistance training (Tomiya 2017). The authors explain that the "supervised progressive RT program was designed to induce muscular hypertrophy (3-5 sets of 10 repetitions) with bilateral arm-curl exercise using 75% of the one repetition maximum (1RM) with 2-min rest intervals" (Tomiya). The RT program was per formed for 8 weeks, twice per week. Figure 2: Overview of size and strength gains; %-ages indicate pre vs. post differences (Tomiya 2017). Significant increases in muscle CSA from pre- to post-training were observed in both the SEP (p = 0.001, effect size [ES] = 0.84) and the CT groups (p = 0.004, ES = 0.45). A significant increase in 1RM from pre- to post-training was observed in the SEP (p = 0.025, ES = 0.91) and CT groups (p = 0.001, ES = 2.38). There were no interaction effects (time × group) for CSA, 1RM, or VO2max. A significantly higher percentage change of CSA was observed in the SEP group (12.1 ± 4.9%) compared to the CT group (5.0 ± 2.7%, p = 0.029), but no significant difference was observed in the 1RM (SEP: 19.8 ± 16.8%, CT: 24.3 ± 11.1%). As I already hinted at, the scientists rightly point out that their "data suggest that significant improvement of CSA and strength can be expected with progressive resistance train ing with subsequent endurance exercise performed immediately or on a different day" (Tomiya 2017). For me, that seems odd, but eventually not impossible. "Cardio Can BOOST Your Gains?! Do it Before Weights and be Rewarded With 28% Increased Fiber Size & VO2 Gains" - This previously discussed study seems to refute the results of the study at hand; but there are a few important differences: muscle groups involved, type of exercise, timing. Putting things into perspective: As usual, there are a few issues you should keep in mind when interpreting the results - with the most important issue being the lack of dietary control. With neither control nor suggestions for energy and protein intake, it's not clear if and to which extent the reduction in biceps gains may be mediated by a decreased ratio of protein intake/energy requirement and/or a reduced ratio of total energy intake/energy requirement. In addition, the absolute differences don't sound anywhere as huge as the 59% relative difference in CSA gains. 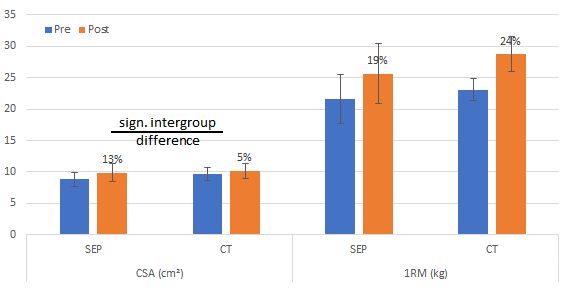 While the SEP group upped their sleeve size from 8.8 to 9.9 cm² (+1.1 cm²), the CT group made it from 9.7 to 10.2 cm² (+0.5 cm²) - that's 0.6 cm² more for the "biceps only" group. It's also odd that the size gains were impaired, while the strength gains were not. Previous studies usually found detrimental effects on both (Hickson 1980, Hennessy 1994, Leveritt 1999, Häkkinen 2003) - albeit in most cases in studies where cardio and strength training trained the same muscle group (legs). The mechanistic explanation for these observations is that the muscle receives disparate signals (Docherty 2000), with one saying build more mitochondria and the other signaling the muscle to increase protein synthesis, is thus not really applicable the study at hand. Plus: The results are inconsistent (Alabinis 2003) and depend on the "modality, frequency, and duration of the endurance training selected" (Wilson 2012). 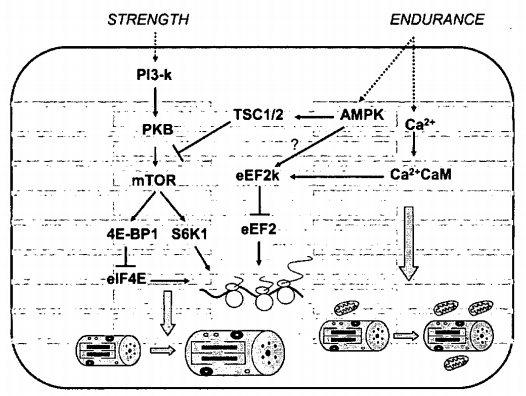 A working model of the intracellular signaling networks mediating exercise-induced skeletal muscle adaptations. 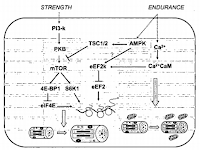 While RT works the mTOR signaling cascade, "cardio" ramps up AMPK signaling, which may (a) inhibit mTOR signaling via TSC and (b) suppress resistance exercise-induced muscle-protein synthesis (Nader 2006). With respect to the observations in the study at hand, the authors speculate that the reduced gains are a potential consequence of reduced "phosphocreatine (PCr) recovery in strength trained muscle [...] due to blood redistribution for subsequent leg exercise" (Tomiya 2017). The authors elaborate: "Increased blood flow in arm muscles is important not only for early recovery of PCr but also for muscle development after strength training. Blood flow might be decreased in the arm during lower extremity exercise due to redistribution". It would be nice if we had fractional muscle synthesis or other data that would give us more than speculative insights into the underlying mechanism of the effect... also, if the scientists' hypothesis is correct, any type of exercise that doesn't involve the previously trained muscle group would compromise your gains. 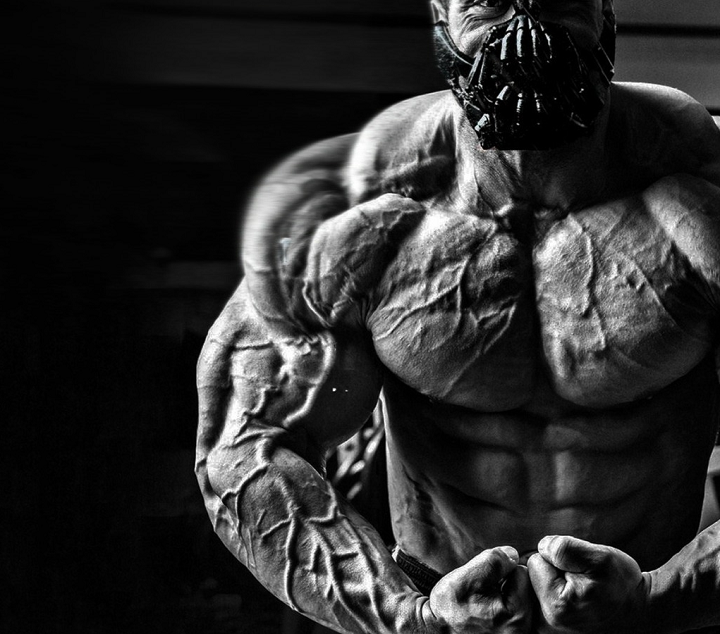 If that's indeed the case, this would mean that you'd better switch to a 6-way split if you want to maximize your gains. Studies that this way of training is superior, on the other hand, doesn't exist. Furthermore, the previously discussed study by Kazior suggests, albeit for cardio before weights, increased gains in fiber sizes, when the same muscle (here legs) are trained during both, the cardio and resistance training regimen. Would be interesting to see what pre-lifting arm cranking would have done to the subjects' gains... but hey: that's a chance for another follow-up | Comment! Docherty, David, and Ben Sporer. "A proposed model for examining the interference phenomenon between concurrent aerobic and strength training." Sports Medicine 30.6 (2000): 385-394. Hennessy, Liam C., and Anthony WS Watson. "The interference effects of training for strength and endurance simultaneously." The Journal of Strength & Conditioning Research 8.1 (1994): 12-19. Hickson, Robert C. "Interference of strength development by simultaneously training for strength and endurance." European journal of applied physiology and occupational physiology 45.2 (1980): 255-263. Leveritt, Michael, et al. "Concurrent strength and endurance training." Sports Med 28.6 (1999): 413-427. Nader, Gustavo A. "Concurrent strength and endurance training: from molecules to man." Medicine and science in sports and exercise 38.11 (2006): 1965. Tomiya, Shigeto, Naoki Kikuchi, and Koichi Nakazato. "Moderate Intensity Cycling Exercise after Upper Extremity Resistance Training Interferes Response to Muscle Hypertrophy but Not Strength Gains." Journal of Sports Science and Medicine 16 (2017): 391-395.